Volkswagen's XL1 two-seat plug-in hybrid made its UK debut in July. Described as "the most fuel-efficient production car in the world", with a fuel consumption value of 0.9 l/100 km, the XL1's monocoque and exterior parts are made largely of CFRP. An initial production run of 250 cars is planned. 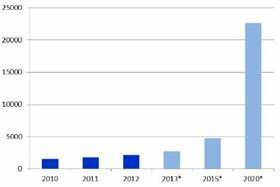 One of the most popular stories on ReinforcedPlastics.com last year was Carbon composites and cars – technology watch 2012, illustrating the huge interest in this topic. Here we take a look at 2013's trends and some key developments. The automotive industry accounted for only 5% (2150 tonnes) of global carbon fibre use in 2012, but it's seen as the market with the most growth potential. This growth is being driven by the automotive industry's continued focus on lightweight construction, greater fuel efficiency and lower emissions. This is according to The Global CRP Market 2013 (published by Carbon Composites eV and AVK), which predicts annual growth of approximately 34% for carbon fibre in the automotive sector to around 23,000 tonnes by 2020. This would make it one of the top three markets for carbon fibre. The report warns that this growth rate is only possible if the cost of carbon fibre reinforced plastic (CFRP) components can be reduced, and the development of mass production techniques for CFRP parts is essential to achieve this goal. 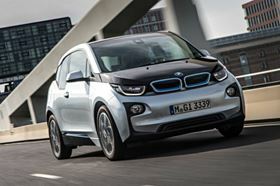 For many, the biggest news of the year was the market launch of BMW's i3 electric car in July. The company's first production vehicle to be driven solely by electric power, the i3 features a new construction concept designed specifically for electric vehicles. This is based around a carbon fibre reinforced plastic (CFRP) passenger compartment fixed to an aluminium chassis (see picture). BMW has chosen to keep its CFRP production in-house and has invested heavily in developing its expertise. This includes the carbon fibre itself. Rather than relying on external suppliers BMW set up a joint venture with carbon fibre manufacturer SGL to build a manufacturing plant. The BMW / SGL plant in Moses Lake, Washington, USA, commenced operations in 2011. Carbon fibre produced here is converted into fabric at the joint venture's second site in Wackersdorf, Germany. These fabrics are used to produce CFRP parts at BMW's plant in Landshut, Germany, and the i3 is assembled at the BMW plant in Leipzig, Germany. 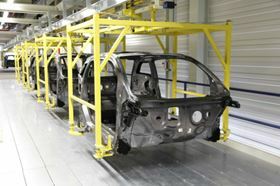 BMW says its automated process makes it possible to volume-produce high quality CFRP body components cost-efficiently. This has allowed manufacturing costs for CFRP body components to be cut by around 50% over the last 10 years, it reports. Heralded as the first time carbon fibre has been used in a (volume) series production car, the i3 has certainly boosted the profile of composites in the automotive industry. We now wait to see how the i3 fares in the sales room and on the road in 2014. 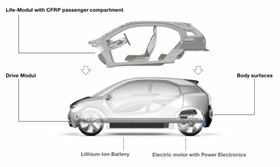 We can also expect news from other car makers as they develop models for the growing electric vehicle market, where the use of lightweight composites helps offset the weight of the batteries. Volkswagen, for example, has incorporated carbon composite in its XL1 hybrid electric car, a limited-production model (see picture). The carbon fibre manufacturers are of course looking to exploit this growing automotive demand. Japanese chemicals giant Toray, for one, has identified the expansion of its carbon composites business in the automotive market as one of its top priorities. It has forged several partnerships and acquisitions in this area, including a joint venture with Daimler, and in September it announced the acquisition of US-headquartered carbon fibre manufacturer Zoltek. Toray has the world's largest production capacity for carbon fibre and a strong position in aerospace applications. The US$584 million acquisition gives it access to Zoltek's large tow carbon fibre technology, which is being developed for applications in the automotive, wind energy and other industrial markets. Zoltek's Panex® 35 carbon fibre is being employed in a number of automotive projects. A sheet moulding compound (SMC) based on Panex 35 developed with automotive supplier Magna Exteriors and Interiors was introduced in March, and in October Krauss Maffei and a number of other industrial partners demonstrated a process for the manufacture of Class A carbon composite exterior panels using Panex 35. In March Zoltek announced a collaboration with German company Thermoplast Composite GmbH (TCG) to develop carbon fibre thermoplastic tapes and other products for automotive applications. It will be interesting to see how the Toray/Zoltek partnership develops. Zoltek's chequered financial history has no doubt held it back; perhaps Toray can implement a more stable development of its technology. The development of automotive composites based on thermoplastic resins remains a popular approach. BASF is directing a lot of investment into automotive composites and in July it announced its Ultracom™ thermoplastic composites for the automotive sector. These products are being developed in cooperation with TenCate and Owens Corning and are based on woven fabrics and unidirectional (UD) tapes impregnated with BASF's Ultramid® polyamide (PA) and Ultradur® PBT thermoplastic resins. In September, TenCate and Kringlan Composites AG, Switzerland, announced a collaboration to develop manufacturing technology based on thermoplastic composites. The companies are currently focusing on the design and production of a carbon fibre composite wheel for high performance cars. In the same month, DSM announced a range of thermoplastic composites based on polyamide resins with various fibre reinforcements. The company says that composites containing carbon fibre based on its EcoPaXX® polyamide 410 (PA 410), Akulon® polyamide 6 (PA 6) and Stanyl® polyamide 46 (PA 46) promise significant weight reduction in car body and chassis parts. In October, Japanese carbon fibre manufacturer Teijin introduced its Sereebo brand carbon fibre thermoplastics. Teijin is currently working with General Motors and other car makers, and in 2011 it reported a technique for the high-volume production of carbon fibre thermoplastic components in a cycle time of less than 1 minute. Alongside materials development, processing and automation techniques for automotive composites are being pursued in numerous industrial and academic collaborations. A process for the manufacture of Class A carbon fibre composite exterior panels (project partners Zoltek, KraussMaffei, Henkel, Chomarat, and Ruhl) has already been mentioned above. In August, Australian company Quickstep announced it was fast-tracking commercialisation of its patented Resin Spray Transfer (RST) technology, which is said to enable carbon composite automotive panels to be produced "in minutes" at low cost, with a high quality finish direct from the mould. Quickstep says it is in discussions with several automotive manufacturers with a view to manufacturing panels using RST technology under licence. The company is also pursuing large-volume production tests in cooperation with industrial partners in Germany, including Audi. In October, German company BREYER, in collaboration with the Institut für Kunststoffverarbeitung (IKV) Aachen and Hille Engineering GmbH & Co KG, unveiled a gap impregnation machine with new tooling technology. BREYER claims this allows the automated production of a CFRP vehicle bonnet in only 15 minutes. This year will no doubt see further developments in the automotive sector in terms of new materials and processing techniques as suppliers and OEMs continue their pursuit of lower cost, faster production of composite components. More partnerships, acquisitions and joint ventures are also likely as OEMs and suppliers seek to accelerate the development of composites technology for high volume production. This article will be published in the January/February 2014 issue of Reinforced Plastics magazine. Artist Alastair Gibson has created carbon fiber sculptures finished with Axalta’s Spies Hecker coating. How one of the strongest, lightest automotive construction materials is overcoming the problems that have so far kept it from entering the mainstream.